Hush puppies are a favorite part of Southern cuisine and are traditionally served with fried catfish. They're delicious small balls of deep-fried dough, similar to fritters, that date back to the Civil War. The recipe is very easy and requires just a few common ingredients you may already have in the kitchen. This recipe is a simple version that uses a base of cornmeal and flour and it can be seasoned in a variety of ways. For instance, you can add grated onion, chopped green onions, or onion powder for extra flavor. 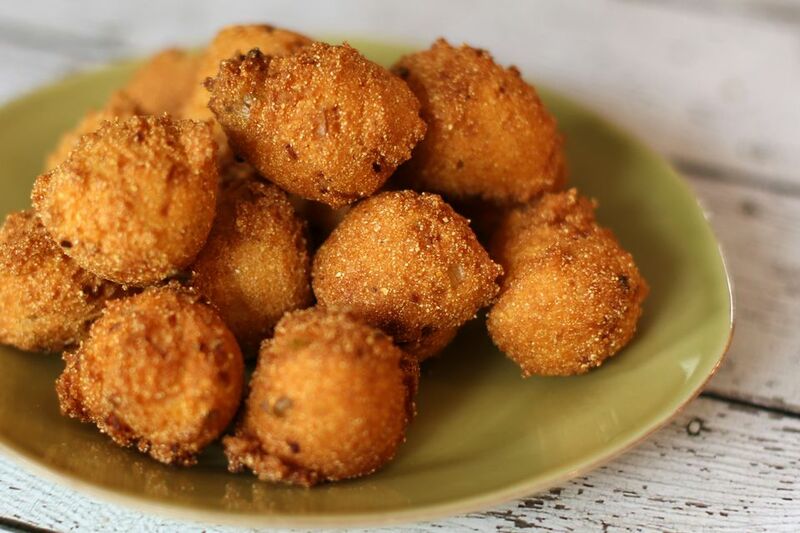 To make spicy hush puppies, simply add cayenne pepper or hot sauce. Cooked corn kernels may be added as well. In a mixing bowl, combine the cornmeal, flour, salt, sugar, baking powder, and baking soda. In a separate bowl, whisk the egg with the buttermilk. Blend the buttermilk mixture into the dry ingredients. The dough should be thick enough to drop from a spoon slowly but easily. If desired, mix in grated or minced green onion, black or cayenne pepper, hot pepper sauce, or other seasonings, vegetables, or similar ingredients. In a deep, heavy skillet or deep fryer, heat fat or oil for deep frying. The hot liquid should be about 3 inches deep, or deep enough for the hush puppies to float. The temperature should be around 370 F.
Drop the batter by teaspoonfuls into the hot fat and fry until golden brown. Remove the hush puppies to paper towels to drain and keep warm while frying the rest. Makes about 24 hush puppies. If you're using self-rising cornmeal and flour, omit the baking powder and salt. To get the batter to drop from the spoon more easily, lightly coat it with a spray cooking oil. If you need to keep the hush puppies warm as you make subsequent batches, heat the oven to 200 F. Move drained hush puppies to a baking pan and put them in the preheated oven until serving time. They'll retain the freshly fried flavor and consistency for up to 20 minutes. Just about any savory or spicy ingredient can be added to these delicious little bites. Some people like to add finely chopped okra, others enjoy jalapeño peppers, and even pineapple can make its way into this popular recipe. A variety of herbs and spices from your pantry can also be combined to create your own custom recipe. Cream-style corn hush puppies are a tasty twist and you might want to try beer-battered hush puppies as well. If you like, it's also possible to make vegan hush puppies by using simple substitutes for the milk and eggs.